I arrived home from work on Monday evening to an absolutely panicked husband. Now, this is not really out of the ordinary, as it does not typically take much to panic my husband. A plane crash halfway across the world, a new disease epidemic, news of an airline merger, a dead bird on the sidewalk, all things that would create complete panic in our household. However, this was a bit different. He informed me that a package had arrived for us in the mail. And pointed to the counter, where a DVD case sat, with a handwritten cover. I walked over and picked it up, and he started screaming, "NO DO NOT PICK IT UP, IT MAY BE LACED WITH SOMETHING. ANTHRAX, OR WHO KNOWS WHAT. PUT IT DOWN NOW." I slowly stepped away from the DVD case, and then washed my hands at the insistence of my husband. After washing my hands, I returned to the DVD. Jeremy found a large Ziploc bag, picked up the DVD with a towel, and placed it inside of the bag. He now felt that it was safe to handle as it was preserved inside of a bag. We read cover and found that it was supposedly a DVD explaining how to meet your neighbors and, "look like a nicer person". We opened the case, through the plastic bag, and found a shattered DVD inside. Creepy. We reviewed several potential scenarios to figure out why and how we received this DVD. Perhaps someone dropped them off for the entire neighborhood, perhaps some kid was playing a joke, or Jeremy's likely answer...it was an attack, and was laced with Anthrax. And so, he decided to call the non-emergency police and report the incident. Now, I don't totally blame him because this thing was really weird. I mean, perhaps a bit extreme, but it seemed to make him feel a bit better at the time. The responding officer seemed to think Jeremy was a bit nuts, and was not concerned at all about our potentially-anthrax-laced-DVD-that-was-sent-to-kill-us. He told him it was probably a kid, playing a prank, and to just relax. This of course caused him to panic even more. I decided to email a bunch of our neighbors to see if they received the same package. I thought that if we were not the only ones, then that would calm him a bit. Our neighbors quickly responded, and it turned out we were the only lucky souls to receive the strange package. Further igniting husband's panic mode. We spent the next hour googling and tracing any information we could find to gather the source of this DVD. 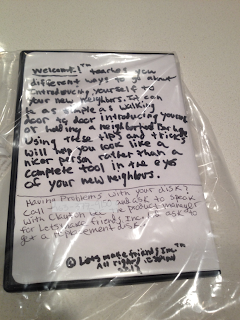 There was a phone number on the DVD, which we were able to trace back to a neighbors house, and eventually, figured out it was a gift from the neighbor boy. This was in fact 13 year old's prank. Not a terrorist attack. 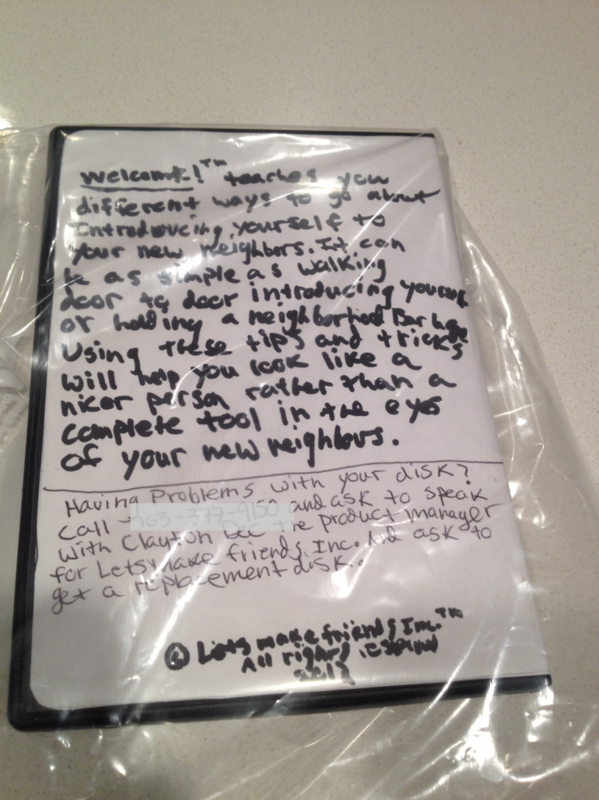 After exchanging a few words with the boy's father, we think this is probably the last time he will place strange DVDs in neighbors mailboxes. And that perhaps this boy will still be grounded when the Franklet arrives. Or possibly until 2025. Good thing our kid will be perfect. Totally perfect.